Toby Schmitz. Photo: John Marmaras. Two highly intelligent American musicians – Joan Baez and Marc Ribot – have told me in interviews this year that Trump’s US is already a fascist state. This exaggerates symptoms of a potential metamorphosis towards fascism, most obviously via racism, scapegoating minorities, discrediting the media, law-enforcement and the judiciary, and presenting narratives contrary to the facts. Clearly Toby Schmitz has been troubled by witnessing such phenomena in Australia, the list expanded by assorted abrogations of human rights, from whistle-blower laws to the indefinite detention of asylum seekers. So the gifted playwright, director and actor has launched a preemptive theatrical strike against fascism, with his new play being a reminder of Nazism’s rise, horrors and demise. Schmitz’s particular focus is on Hitler and his henchmen’s obsession with art. They drew inspiration from Wagner, defined “degenerate” and worthy Aryan art, and later looted the Louvre and countless other European museums, filched treasures of Egypt’s antiquity and planned the destruction and triumphant rebirth of Berlin. To varying degrees Hermann Goering, Heinrich Himmler, Joseph Goebbels and Albert Speer were arts-literate, inevitably following Hitler’s lead of preoccupations with painting, music and architecture. These five are characters in Schmitz’s play, joined by Reinhard Heydrich (Rupert Reid), the holocaust’s author, and narrator Megan O’Connell. They neither wear Nazi uniforms nor adopt silly accents as they lead us through the party’s history. Schmitz wants them to be as ordinary as possible, because if we are only on the lookout for two-headed mass-murderers, the truly dangerous people – the ones who seem of and like us – will slip past our political scrutiny. Giles Gartrell-Mills, Henry Nixon and Toby Schmitz. Photo: John Marmaras. Although little in his history or interpretation of the protagonists is new, there is much to admire in the play, itself. Schmitz has penned language sufficiently poetic for the players to roll the words about in their mouths, chew on them and spit them out. 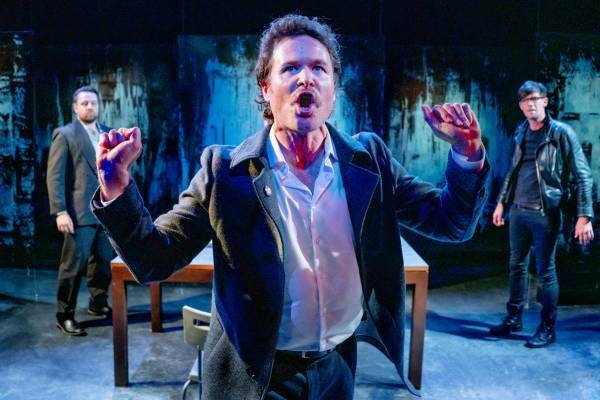 One hears echoes of those absurdly underperformed plays of Steven Berkoff’s such as East, West and Greek, in which the language may be heightened beyond the scope of the character, but not beyond the scope of the work as a whole. 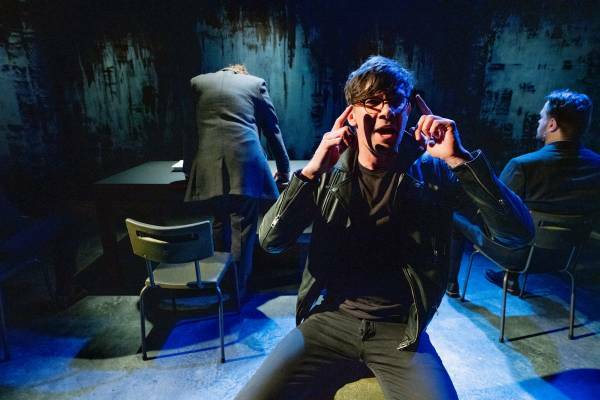 Like Berkoff, too, Schmitz has directed Degenerate Art with bullying, crunching choreography and belligerent delivery, while also letting the play poke fun at itself, so the whole pretence of performance as reality is routinely punctured. Amid this, Hitler (Henry Nixon), Goering (Giles Gartrell-Mills), Goebbels (Schmitz), Himmler (Guy Edmonds), Speer (Septimus Caton) and Heydrich can often seem like cartoon characters. Now the likes of Trump or Abbott are routinely played for laughs, but the point is they are inherently buffoons (however destructive), while the leading Nazis – possibly Goering apart – were not. And therein lies the work’s fundamental flaw: I never felt terrorised by these people. O’Connell gives us litanies of horrors, but the menace conveyed by the actors is sufficiently diluted by the cartoonish satire to make any real sense of threat anaemic. Schmitz is right: these people were ordinary men as well as being monsters, but for us to walk out of the theatre unshaken is self-defeating. It is to make light of his own intent. Nonetheless the play is crowded with potent moments of writing, directing and performance (including from the author), and includes screen contributions from Aron Murray of the works of art they dissect, delect, abhor or steal. Nixon’s Hitler is as much critic and actor as he is ideologically-driven tyrant. Perhaps we should really start to worry when the current extreme right loses it Philistinism. John Shand is a playwright, librettist, author, journalist, drummer and critic. He has written about music and theatre for The Sydney Morning Herald sine 1993. His books include Don’t Shoot The Best Boy! – The Film Crew At Work (Currency), Jazz – The Australian Accent (UNSW Press) and The Phantom Of The Soap Opera(Wizard). In 2017 he won the inaugural Arts Journalism Award at the Walkleys, the nation’s preeminent awards for journalism. He lives in Katoomba (NSW) with she who is called The Mouse. He enjoys wine, and wishes he could say in moderation.